Animals typically observed in the mixed forest community include white-tailed deer, gray squirrel, red-shouldered hawk, pileated woodpecker, barred owl and a variety of snakes. The less densely wooded festival area provides open spaces for several gopher tortoises. Manatees may enter the spring run during cooler weather. Many migratory and local bird species abound, such as the great blue heron, snowy egret, white ibis, king fisher and even a flock of wild turkeys. The red-shoulder hawks use this park each spring to nest and raise its young. 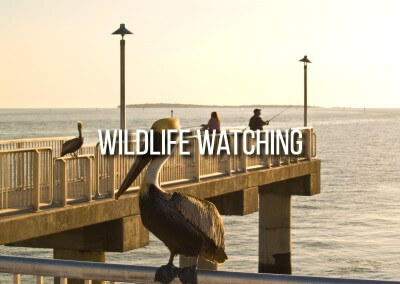 Sightings of the Florida panther, white-tailed deer, bobcat and manatees have been documented. It’s easy to spot several varieties of turtles in these waters. Put on a mask and snorkel and watch schools of gar, bream, mullet and bass move through the clear spring water, and beavers work in this area. Typical bird species found in these habitats include Mississippi and swallow-tailed kites, broad-winged hawks, Acadian flycatchers, summer tanagers, and prothonotary and hooded warblers. Owls, pileated woodpeckers and red-shouldered hawks may be seen year-round. Many species of reptiles and amphibians are present also.